Earlier this week, we reported on several cultural institutions in Colorado that had begun adopting policies allowing concealed weapons on their premises, which includes handguns and, in some states, pepper spray. Some officials appeared to support the change in policy to allow concealed weapons. An official from the Denver Museum of Nature and Sciences indicated the museum board felt it was an adequate response in light of the recent mass shootings to best protect their patrons. However, it’s very likely some patrons would not feel the same way, and we wondered if the museum was risking alienating some visitors. Other institutions, like some zoos in Texas, are also wondering about the ambiguous impact of changing gun laws, particularly in light of President Barack Obama’s executive order on gun restrictions. New gun laws in Texas will 1) allow licensed carriers to openly carry handguns and 2) sanction individuals or organizations that ban licensed carriers from openly carrying handguns on their premises. Some premises are excluded from these new laws as “gun-free zones,” including schools and courthouses, and the owners of privately held businesses may choose to ban weapons on their property on an individual basis. Zoos are among the institutions caught in the middle, as some are privately funded entities on public property. With many young visitors, zoos have their own special interest in banning guns, but are they allowed to under the law? Tim Morrow, the executive director of the San Antonio Zoo, a nonprofit entity, says it will ultimately come down to what the attorney general says, because each city is assessing the situation differently. “This day and age, people are just nervous. We have so many families with small children, and the small children may not understand why someone is at the zoo and walking around with guns while there’s animals,” said Morrow. 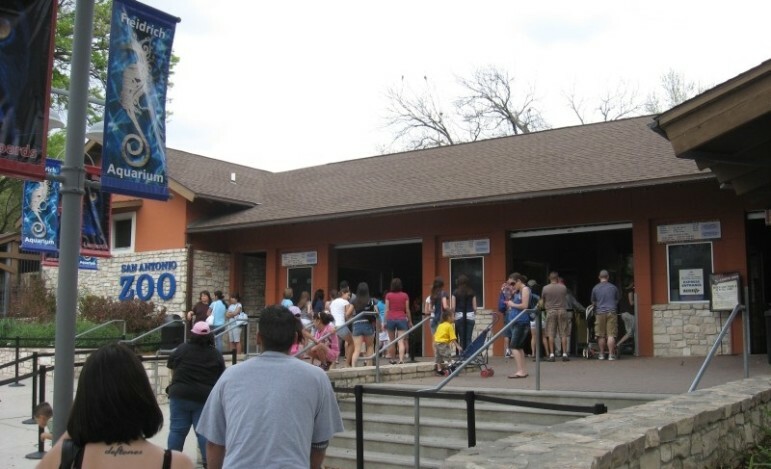 The San Antonio Zoo will still allow licensed carriers to bring concealed weapons into the zoo. Other zoos are arguing that they qualify as education institutions and so are allowed them to defy the open-carry law. “Given the mission of the zoo and the presence of hundreds of thousands of children on its campus, it is clear that guns and zoos simply do not mix,” said the spokeswoman for the Houston Zoo, Jackie Wallace, in a statement. They are not regulated by Texas Education Agency, they are not part of any recognized school district or educational system, they do not issue a degree, they do not have degree plans. They are just simply a place where people go to learn things. Nicole Knox, a defense attorney experienced with firearms-related cases, says that the zoos may only be able to bar guns in locations where actual teaching or educational efforts take place. Alternatively, zoos may utilize the “amusement park” exception, but that would also include a host of difficulties. Amusement parks have very specific requirements: they must be able to accommodate a population of 1 million visitors and have 75 acres in total property. Police officers may also face difficulties in assessing situations where organizations have open-carry laws. Kevin Lawrence from the Texas Municipal Police Association wondered what authority police officers have in situations when civilians feel threatened about an individual carrying a gun. Do police officers have a right to intervene? Alternatively, will these gray areas in the law further create issues and friction between the community and the police? Similarly, businesses are wondering if siding one way or the other with the law will inevitably alienate patrons. Texas Attorney General Ken Paxton’s office has received 24 complaints so far since the laws were adopted in September. Some, like Knox, have wondered what exactly this fight over open-carry laws really is about. Do advocacy groups truly believe their rights are curbed because they can’t carry a handgun navigating through large groups of students on a class field trip to the zoo? Bizarre rules governing the “event zone” surrounding the Republican Convention in Cleveland prohibit all kinds of everyday items but explicitly allow firearms.